When I mentioned the property census project at a Nature Tourism Partnership meeting late in January, the suggestion was made to include the Golf Course. It seemed like a no-brainer, but I had simply not considered adding this piece of relatively adjacent landscape to the surveys. The golf course is only about ¾ mile away from the western side of the main Moody Gardens property with open airport space between and a marsh and woody scrub fringe connecting the north end of both areas. I took a few hours on the afternoon of 31 January and rode around in a golf cart surveying the course and some of the natural surroundings. I followed this initial survey up with a second trip on 9 February. The golf course includes about 170 acres of open, manicured grass landscape mixed with some low dividing shrub tree lines and several freshwater pond habitats. There is also a 25 acre wild scrub field bordering the north margin that connects with Offatts Bayou as well as the large open expanse of the airport property. A large extension of tidally influenced brackish water known as Sydnor Bayou runs up the center of the course. A fairly dense scrubby tree grove located at the very southeast end of the course bordered by the corner of the airport property and Stewart road offers a neat pocket of wilderness that has proven rich in bird species through these two surveys. The combination of open grass areas with freshwater ponds are habitats that we don’t see on the main Moody Gardens complex. 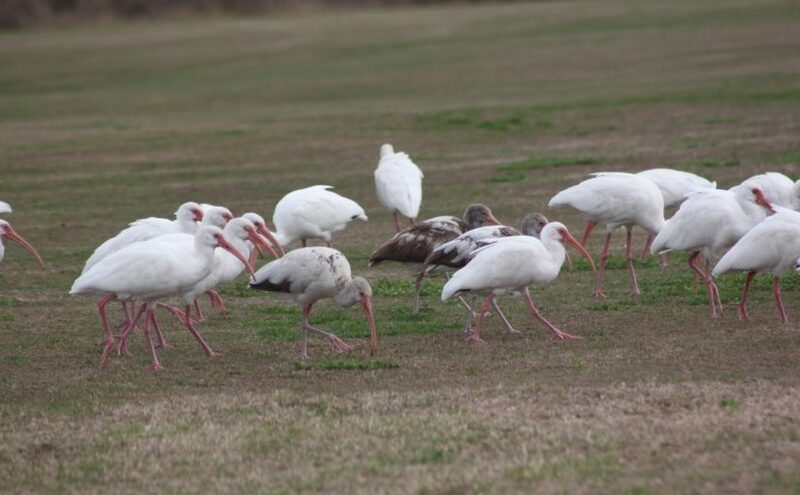 These areas offer the opportunity to see many waterfowl species as well as the open ground foraging species like the White Ibis pictured above. This large flock included at least 3 juvenile birds that showed a nice progression of feather change from their first year brown plumage through the second year white plumage. Their long curved bills are perfect for probing down into the ground looking for tasty invertebrates. A couple similar species; Long-billed Curlew and Marbled Godwits are also likely to be seen using these open grassy fields as their forage grounds. The large, iconic Sandhill Cranes also forage across the open grassy habitats much to the dismay of the golf course groundskeeping crew as their methods are much more destructive than the smaller probing bills. The waterfowl diversity through the winter months is a great draw for anyone interested in these other “birdies” on the course. Through the two surveys thus far I’ve logged 9 species of waterfowl with 4 new species in the totals. Through the 2 trips I counted 49 species with 10 that have not been seen in the main property surveys. Gadwall, Mallard, Mottled Duck, Blue-winged Teal, Green-winged Teal, Northern Shoveler, Lesser Scaup, Red-breasted Merganser, Ruddy Duck, Pied-billed Grebe, American White Pelican, Brown Pelican, Neotropic Cormorant, Double-crested Cormorant, Great Blue Heron, Great Egret, Snowy Egret, White Ibis, Roseate Spoonbill, Osprey, White-tailed Kite, Sharp-shinned Hawk, Red-shouldered Hawk, Crested Caracara, American Kestrel, Common Moorhen, American Coot, Sandhill Crane, Killdeer, Spotted Sandpiper, Willet, Long-billed Curlew, Laughing Gull, Ring-billed Gull, Rock Pigeon, White-winged Dove, Belted Kingfisher, Eastern Wood Peewee, Loggerhead Shrike, Carolina Wren, Ruby-crowned Kinglet, Northern Mockingbird, European Starling, Yellow-rumped Warbler, Savannah Sparrow, Red-winged Blackbird, Eastern Meadowlark, Great-tailed Grackle, and Brown-headed Cowbird.